With the new flat and a lot of new spaces to be filled I can't stop thinking about little pieces that would make each corner more special. So here we have a much more house related wish list rather than my usual cravings. The marble lamp would give the perfect medium light atmosphere to my living room with a very simple yet sophisticated design. Candles have been one of those things I have started buying obsessively but this Byredo candle is not just you every day regular candle with its Patchouli base and floral and fruity notes would be the perfect fragrance for the living room. 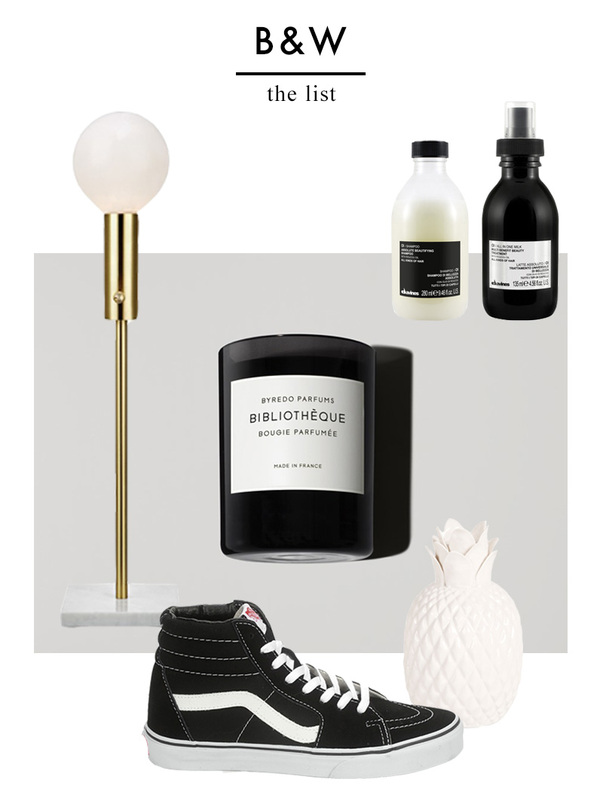 The Zara Home pineapple vase has been on my wish list for months and the new flat is the perfect excuse to get it. And even though I'm more focused on my new little home I can't stop having my own little personal cravings, as these awesome Vans I have been eyeing at Spartoo since forever for that cool off duty look I love, plus the are super comfy! At last, hair is one of those issues I have in my life, and dryness is a major problem so I've been super curious to try this new Davines Oi Essential Haircare line. Tenho esse modelo de vans e tem sido difícil tira-las dos pés.